Split-Screen. I hate it. How many times have I been cursed to play an awkward shaped half-screen just to enjoy life's simpler pleasure of giving a fistful of boomstick to a Badass Skag with a friend? Sony may just have a solution to our woes. It, of course, isn't cheap. However, in the coming years when 3d becomes more and more affordable, You and you friends may just be able to enjoy full screen co-op play. On the same TV. Now, the diagram may not provide much info, so I'll explain. APPARENTLY, these glasses will filter different images out for each player, so Player 1 will see only his screen, and Player 2 will only see theirs. I suppose it was only a matter of time, since the very nature of 3-D is showing different images in each side. It's the next logical step. 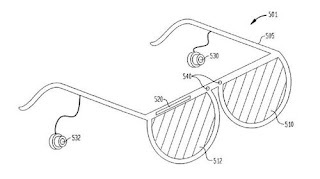 It's also noteworthy that the glasses have earbuds as well, which means that separate audio isn't out of the question either. For those of you that LAN multiplayer (I'm looking at you Halo), you now longer have to worry that the other guy is going to find your sniping spot by watching your half. And those of us will more...modestly sized TV's will no longer have to squint and strain to see whats going on in our half, while our friend is being shredded by the enemy. A fine innovation Sony. And a practical reason to actually wear those ridiculous glasses. Well played. 3-5 years in the future, when they're affordable, I will enjoy it very much. Now you can't see what play i'm picking in Madden. You don't stand a chance, mofo. Just kidding. I'm not playing video games with stupid glasses on for any reason whatsoever. I'll play Madden on DS to get separate screens. They'll probably never use this patent anyways like the other 100 somewhat-interesting ones that they've filed in the last 5 years. *nods* I suppose we'll have to wait and see. And for all we know, they're going to look badass. Maybe they'll release some really nice designs. Then you have a choice of looking like a goof in ridiculous glasses, or looking like a douche for wearing badass sunglasses INSIDE. I'm certainly interested to see the technology at work though.